Tool for drilling holes in planks and frames. 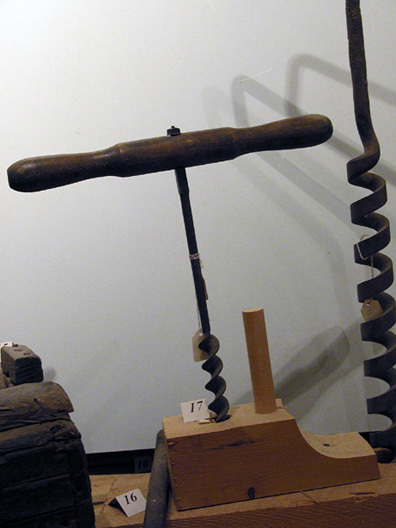 This size auger is appropriate for treenails, or trunnels, the wooden fasteners used in shipbuilding. Tool for drilling holes in planks and frames. 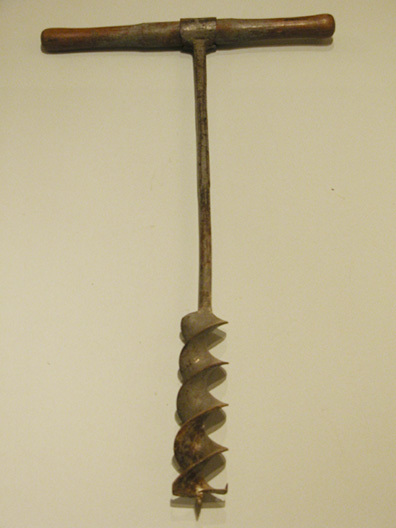 This size auger is appropriate for treenails (trunnels), the wooden fasteners used in shipbuilding. 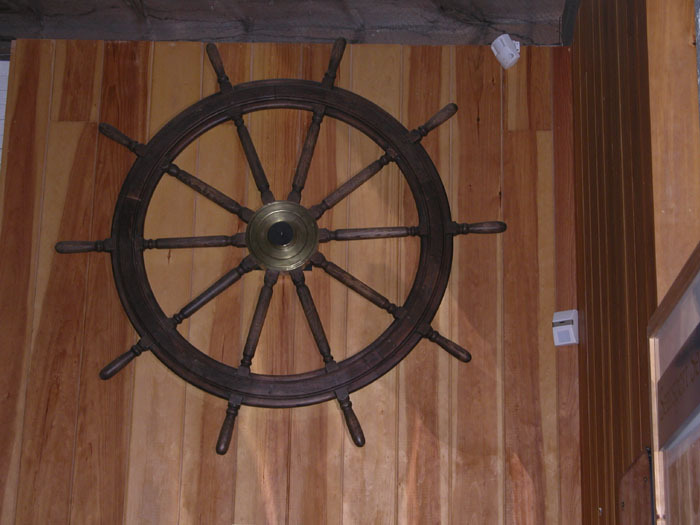 Ship's steering wheel, with ten spokes and a brass hub. Diameter of the outer rim is 46 inches. This is a typical steering wheel for a Down Easter. 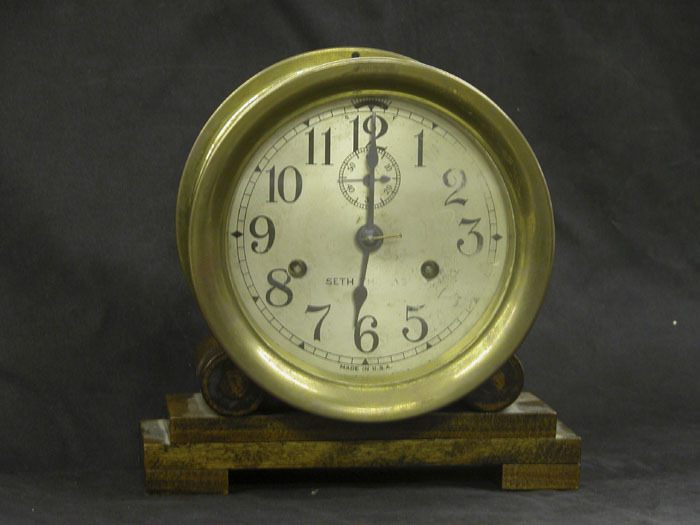 Seth Thomas ship's clock, strikes up to eight bells, every four hours. Bells are rung evey half hour starting at 30 minutes after the hour: 12:30 is one bell, 1pm is 2 bells, until 4 pm is reached at 8 bells. The sequence is started again. 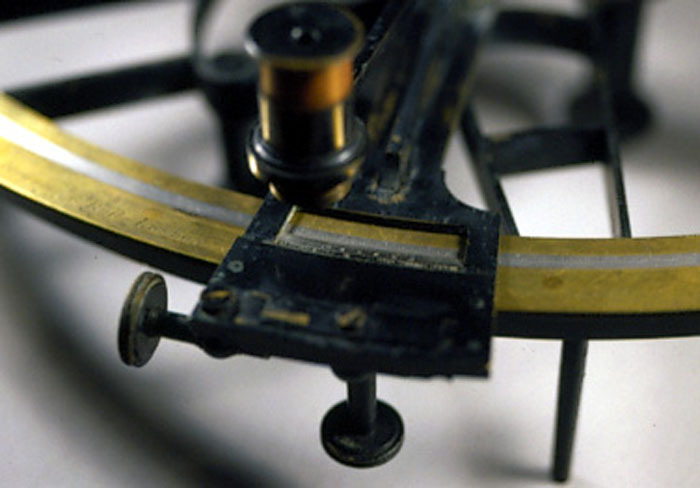 The half hour interval dates to when time was measured with a half hour sand or hour glass. The glass would be turned over every half an hour and a sailor would ring a bell which could be heard all over ship. Watches change every four hours at eight bells. 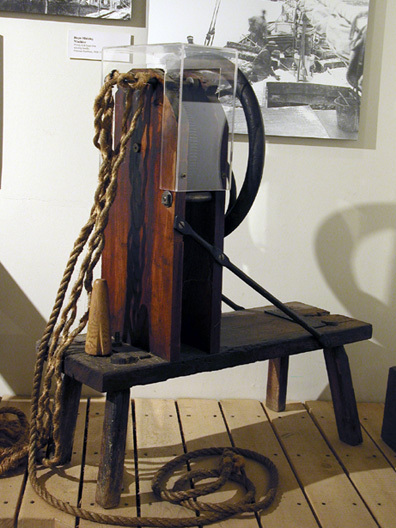 Ship's bell with clapper and lanyard, from the vessel Evelyn. Bell is 11" high and 11" in diameter. 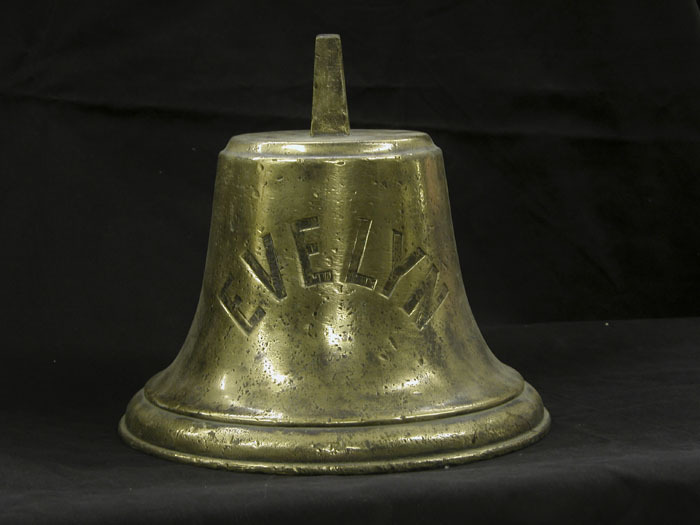 While there were dozens of vessels named Evelyn, this bell came from a Searsport family and may well have been aboard a Searsport built bark, Evelyn, built in 1851. 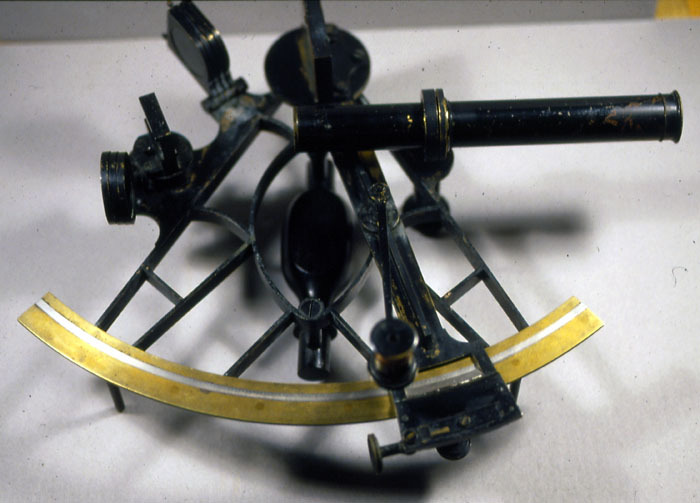 Bells were used aboard ship to mark every half hour, with eight bells every four hours marking the change in watches. 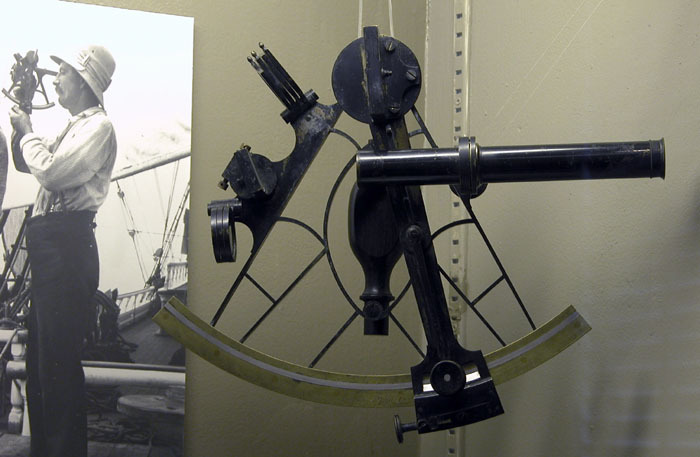 This sextant was owned by Frederick L. Waterhouse. Frederick was born in Searsport in 1841; his four brothers all became ship captains, but he only became a mate. After his service in the Civil War, he settled in Montville, Maine, never becoming a sea captain. His initials are inlaid into the cover of the sextant box, something he could well have done, a not uncommon practice amongst ship officers. 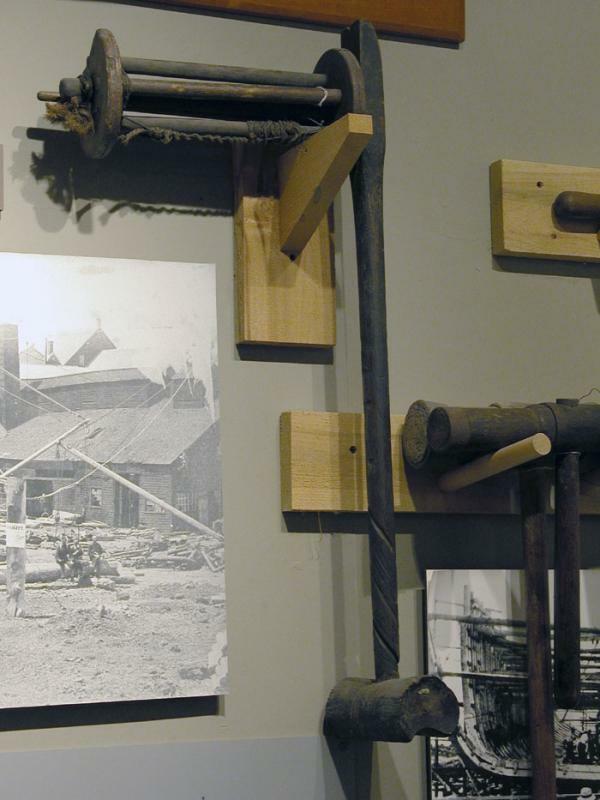 Serving mallet, with spools, used in shipbuilding as a rigging tool. The serving is the marline that wraps standing rigging, to protect it from rust and rot. The mallet winds around and around the stay. The marline feeds from the spool and is wrapped tightly around the stay or shroud. 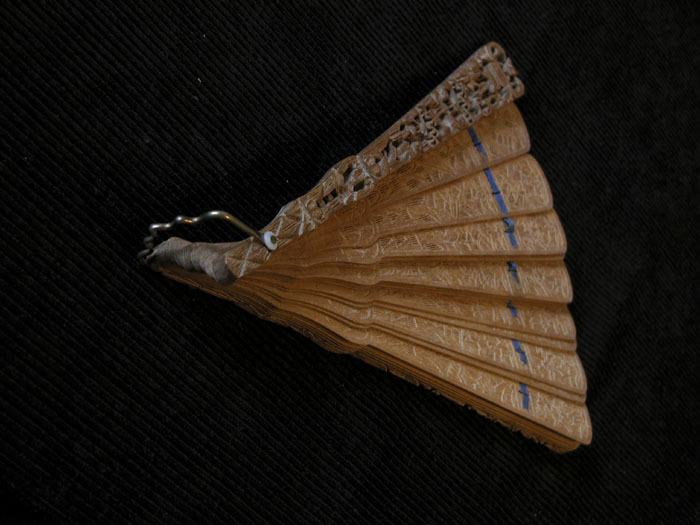 Sandalwood fan with intricate three dimensional carvings on both end pieces as well as on the fan's slats. This fan is Japanese; fans were an important part of both Chinese and Japanese cultures. They were a popular souvenir for captains. 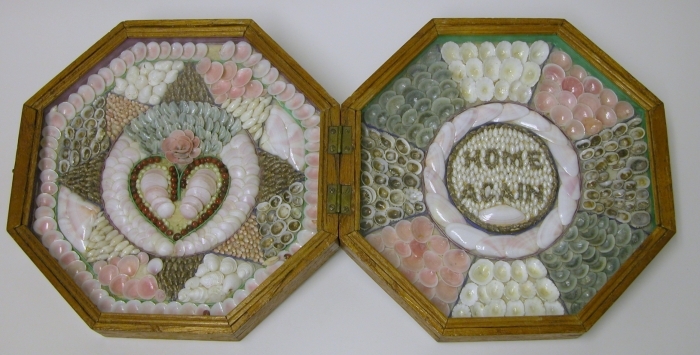 Sailor's Valentines are a form of sea shell art, popular in the 1800s, when sailors brought them home to their wives, girlfriends, mothers, or sisters. Most Sailor's Valentines were made in the West Indies, on the island of Barbados, between 1830 and 1880, but production continued into the early 20th century. People used to think that sailors made them aboard ships, but research has shown almost all were made in Barbados for sale to British and American sailors.